Derek Edgar of N Edgar & Son Dromara H.P.S with left “Wee Chrissy” 1st Open INFC Skibbereen and right “Champion 06” 1st Open NIPA Rosscarberry. The Irish National Flying Club final race of the 2018 season was delayed due to poor weather conditions, one day its perfect and the next hopeless. The race was due to be flown on Saturday 22nd September but the birds were marked that day for a proposed Monday liberation. Everything worked out well with the birds released in Skibbereen at 9.30am in a light North Westerly wind. After a poor young bird season all round entries were well down and probably not helped with both NIPA and ISRF racing on the same weekend from County Cork. 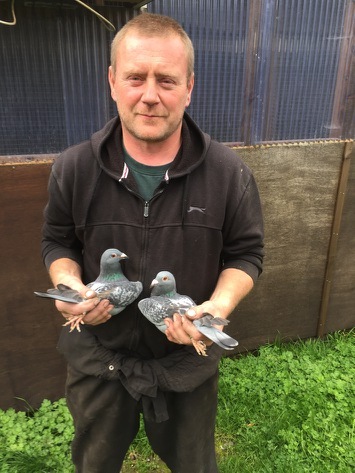 In the Irish Nat FC 232 members across Ireland sent 2,022 birds competing for pools and prize-money of £8,653 a big reduction over the previous three years. In 2017 255/2,275 competing for £9,211, 2016 it was 310/2,966 and 2015 up again at 385/3,622. As with the Old Bird National the race was divided into 3 x Sections and I will cover the Top 5 in each section in this article. Any one of the three Sections could have won the race, always a good sign of success. Overall winners were N Edgar & Son from Dromara 1st North Sect doing velocity 1578, Middle Sect 1st & 2nd was T McLoughlin of Finglas winner doing velocity 1567, and 1st South Sect was the Bolger Family Wexford North & South doing velocity 1556. It was a unique weekend for the winners N Edgar & Son, in the race from Rosscarbery National the previous day the loft won 1st Open NIPA. Report & Results by HOMER click here! Don’t forget details and photo for the Top 5 in each Section to be included in Race Report.